The Invacare Shower Chair with back offers stability, comfort, and tool-less assembly in seconds. The all-composite legs have precise twist height adjustments from 15 - 21" and large rubber tips for additional stability. Deep contoured seats and ergonomic backrests provide maximum showering comfort. Fit into most standard tubs. Large contoured seating surface (18"x20"). Overall Depth at Base: 17 1/4"
Overall Width at Base: 16 1/4"
This is a great shower chair. Functional. Easy To Install. Safe. Lightweight. Sturdy. A GREAT buy.. Great stability. A GREAT shower chair. This is a GREAT shower chair. We had another chair, but have found this one to be much more stable. I feel much better about my wife's safety, now that she has your chair. Functional. Lightweight. Sturdy. Was easy to put together . Was easy to put together . Easy To Install. Safe. I had purchased it for my Wife to use in walk in shower after knee replacement which was last Dec. and she is still using it since she feels a lot safer setting down to shower instead of standing up. Great,well build product and no metal parts to rust! by KODDA from Pueblo West,Co. Inexpensive help for us larger folks. Easy To Install. Functional. Safe. Sturdy. Disabled. Residential. Elderly. Following Surgery. Easiest in the world to put together, however it works great if the legs are put in the shortest mode or the tallest mode. In Between and the legs are allowed to move and get uneven. I have mine cranked up all the way and that's a size that I have to have my feet on my toes to reach the bottom of the shower, but that makes it easier for me to put my feet on the tub ledge to scrub my legs. You can hear an audible click when the legs are extended all the way, or shortened all the way. Any in between setting and the legs are free to move. Easy To Install. Safe. Sturdy. Functional. Functional. Easy To Install. Safe. Lightweight. Sturdy. I love this chair because it's sturdy and strong. 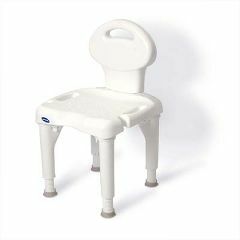 It has a large comfortable seat and makes bath time much safer. Are the rubber feet replaceable? What would the part number be and who provides/sells them? Why is the order for two chairs more expensive than twice the single chair price? Not covered by Medicare w/ or w/o a prescription, regardless of the need. what is the tallest height? what is the width of the legs, our tub is narrow? Is the back support removable? What are the specs of this chair? We had our shower stall modified to a walkin and the shower chair sets in there just great. My Wife really loves it so now she can set down instead of standing up while holding on to our safe bar that we also installed. Answered on Jan 10, 2013 10:47:34 AM by KODDA from Pueblo West,Co. Specs are listed under 'product overview' section. Not heavy, easy to move around in my narrow tub. My shower is very narrow; I'm not sure this chair would fit. Are there any specs available for this product? Asked on Jun 14, 2011 6:32:03 PM by Trexx07 from Phila. Width is 16 inches at feet, 19 1/2 inches at seat. The length of the seat is 16 1/2 inches front to back.